Compact SUV shoppers will find their perfect fit behind the wheel of the latest 2019 Mazda CX-5 from Bert Ogden Edinburg Mazda in Edinburg, TX. Crafted with a sleek and durable exterior, this compact SUV is ready to take you anywhere. 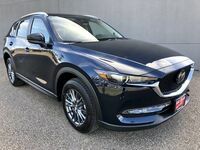 Wearing a budget-friendly price tag of $24,350, the 2019 Mazda CX-5 is nothing short of a knockout. Built with the latest in-car technologies and safety features, you’ll look forward to getting behind the wheel of the CX-5 every chance you get. Offered in five trim levels – Sport, Touring, Grand Touring, Grand Touring Reserve, and Signature – and seven striking colors, the 2019 CX-5 can be customized to perfectly fit your lifestyle. Continue reading to see what the CX-5 can to your life, as well as how it stacks up against the competition in this 2019 Mazda CX-5 vs 2019 Jeep Cherokee comparison. What are the differences between the 2019 Mazda CX-5 and 2019 Jeep Cherokee? The 2019 Mazda CX-5 is able to get you wherever you need to go without ever stopping short of your destination. Earning an EPA-estimated 25 city/ 31 highway mpg, you can always rely on the CX-5 to get you where you need to go. Powered by a SKYACTIV®-G 2.5-liter DOHC 16-valve 4-cylinder engine, the CX-5 generates 187 horsepower while on the road. The competing 2019 Jeep Cherokee wears a higher price tag of $25,240 for its lowest trim, powered by a 2.4-liter I-4 MultiAir® engine. The Cherokee generates 180 horsepower on the road while getting you an EPA-estimated 21 city/ 29 highway mpg. The backseats in the Mazda CX-5 feature 40/20/40-split-capability that let you fold them down with just one touch. The CX-5 offers you 30.9 cubic feet of cargo space in the rear when all five passenger seats are in their upright position. If you are looking for more room to carry your sports equipment or camping gear, fold down the rear seating to expand your vehicle’s cargo area to a spacious 59.6 cubic feet, giving you room for all you need to carry and more. The competing Cherokee gets drivers 24.6 cubic feet of cargo space while all five seats are engaged or in use. The 60/40-split-capable rear seats will increase the Cherokee's cargo area to 54.9 cubic feet when folded. The 2019 Mazda CX-5 is the complete package for any lifestyle. Stop by the Bert Odgen Edinburg Mazda lot in Edinburg, TX to test drive one of our CX-5 models today to see why it’s a favorite among so many drivers.